Over the past several months, we have been talking about the KansansCan vision and how it relates to the Emporia Public Schools. We were fortunate to have more than 50 patrons in attendance at our board study session in October when we talked about #KindergartenReadiness. Kindergarten Readiness is the first outcome of KansansCan, with the ultimate outcome being Postsecondary Success. So let’s fast forward to 2029. That is the year our current kindergarten class will graduate! I want to shift the conversation to postsecondary success – what it looks like and how we can help students achieve that goal. One thing is clear, postsecondary success starts during the early childhood years. According to the Georgetown University Center on Education and the Workforce, our state will need 72 percent of its graduates to have some form of postsecondary education or training for the jobs that will be available in 2020. These are jobs our future adults will need to achieve a middle class income. The jobs that require a high school diploma or less are disappearing. In order for our state to meet the 72 percent threshold, all of us in education and as parents have work to do. It is our responsibility as educators and parents to steer students toward a plan for post-secondary education, whether that is through a community or technical college, a certificate program, or a four-year college. First, it is vital that students, parents and educators embrace the Individual Plan of Study, a roadmap that will help kids identify interests and the coursework that will lead to jobs in those interest areas. Emporia High School has been a leader across the state with the Individual Plan of Study concept and we are in the process of implementing the plans with middle schools students. Don’t let Individual Plans of Study scare you. They do not set a student’s career path in stone; they are flexible as students experience electives and find new interests. Many courses apply to several career paths. Individual Plans of Study are a symbol that learning does not end at high school graduation. Students and parents also need to leverage the power and potential of state funding for technical education (Senate Bill 155). This bill provides incentives for high school juniors and seniors to take technical college courses before high school graduation, with a majority of those courses being offered at no expense to the student. Finally, we are in the early stages of looking at data regarding graduation rate, dropout rate, postsecondary perseverance, and the percentage of graduates that achieve some form of postsecondary certificate, license or degree. We will continue to research, analyze and make adjustments as we look further into that data. 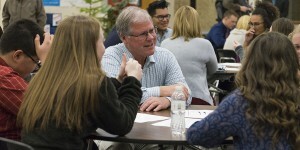 A number of community business partners joined community conversations that Dr. Britton Hart hosted at EHS on January 5 to help us build a vision of the skills our graduates will need to be successful adults. The USD 253 Board of Education will continue the postsecondary success conversation at a study session on February 22 at Mary Herbert Education Center. The meetings that Dr. Hart held were a great way to involve staff, students and the business community in building a vision of what our graduates need to be successful. As we continue to embrace the journey of achieving postsecondary success for all students, we hope the conversations will be rich and involve a large group. The success of the journey comes from a combined effort to help our students reach their fullest potential. I encourage you to join this important discussion.